Despite the fact that Cornell Woolrich wrote a lot of novels and stories you might have heard of — Hitchcock’s Rear Window was based on a Woolrich story, and so was François Truffaut’s Mississippi Mermaid — he’s not as well known today as he might be. Thanks to copyright issues, most of his novels have been out of print for years. Having just finished one of them, I can definitely say that this seems like a shame. 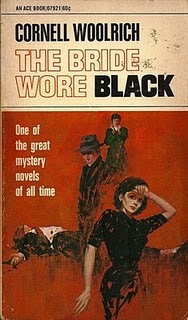 The Bride Wore Black is as lean and twisted as the bride’s revenge itself. The book is clean and methodical: each chapter is titled after one of the bride’s intended victims. There are three movements within each chapter: Julie Killeen’s false identity (the persona she assumes to kill each man); the murder; and the post-mortem, with the complete bewilderment of the police. Neither the police nor we know why Julie is doing what she’s doing. Stretches of time lapse between each murder. Yet each one is spare, tight, without a single misstep. This calm, precise, orderly method of doing something that seems completely insane makes Julie a compelling character to follow. This mystery subverts a number of the usual noir paradigms. For one thing, it places the femme fatale in the central role, in the place of a hero. Instead of watching the woman in the piece with masculine contempt, we watch her with empathy, and even root for her success in murdering people we know nothing about. Then, too, the murders take place either offstage or with the sparest description possible. Woolrich is not out to glorify violence or to take morbid pleasure in these murders. On the contrary, the tone is melancholy, bittersweet. I won’t tell you why Julie does what she does, or how the police finally discover it, mostly because Woolrich withholds this information himself, almost as protection for Julie. Find out yourself. This is a truly distinctive, well-written, interesting noir novel that I didn’t want to put down. I love Cornell Woolrich–much of his work typifies the concept of “noir” but with a twist. My favorites are I MARRIED A DEAD MAN (after a train crash, a woman adopts the life of one of the dead passengers) and WALTZ INTO DARKNESS (a wealthy New Orleans businessman pursues the woman who scammed him; this is the basis for both “Mississippi Mermaid” and the Angelina Jolie movie “Original Sin”). He lived a rather sad and solitary life, but his fiction is dynamic. Both of those sound wonderful! Yes, I think I liked this novel better than any other noir I’ve read except maybe the Jim Thompson novel I recently reviewed. It was so well-written, and not at all cliched. I think this might be a good place to start, even though it’s got a twist to some of the usual noir tropes. I really enjoyed this one, more than some of the more “typical” noir authors I’ve read. 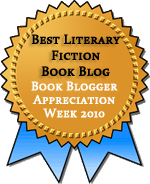 A black widow story – cool! How did you get your hands on the book? I got it through some long ILL wrangling at the library. It took them weeks to get it for me, but I finally did get it! This book was also made into a Truffaut film starring the fabulous Jeanne Moreau, although, if I remember correctly, you learn her motive right away. Yes, I saw that it had been made into a film! I might try to see it someday. Jeanne Moreau, yum. I’ve wanted to find a copy of this book for a while, the title intrigues me! My husband is reading The Phantom Lady by Cornell Woolrich right now, occasionally he says it’s the best noir he’s read. You know, I wouldn’t be surprised. Except for The Killer Inside Me (very different in tone), I think this is the best noir I’ve ever read, too. Sold! I’m adding it (and Woolrich) to my lists right now. I’ve been looking for more noir but am a bit burned out on Hammett and Chandler. This sounds like a great alternative. I found both this and the Jim Thompson I read to be sort of noir with a twist, and I preferred the ones with a twist, if you know what I mean. This sounds wonderful and I love that cover! I agree, the cover is great! Woolrich was recommended to me by one of my ex-bosses who knew I liked mysteries. I hadn’t read much noir before (except for a couple of novels by Dashiell Hammett) but I really enjoyed his novels. I think I got a 3-in-1 book which included this novel. A 3-in-1 would be perfect. I am definitely looking around for others of Woolrich’s novels since this one was so good.